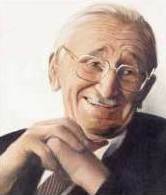 Hayek: Image available for free publishing from the Volkswirtschaftliches Institut, Universität Freiburg, Freiburg im Breisgau, Germany. Copyrighted free use. Copyrighted free use. Esta é uma imagem retocada, o que significa que a versão original foi alterada digitalmente. O original pode ser visto aqui: Mises,hayek,shumpe.jpg.